Lime electric scooters are charged each night by ‘juicers’ like Thomas Odlum (21C) who then return them to specified locations each morning. Forrest Martin/Senior Staff. What do dog memes, $38 coconut oil and high school students have in common? For most of us, virtually nothing. But for Jasmine Cui (20C), they are all part of her side-hustle portfolio. With increasing frequency, students like Cui are rejecting traditional part-time work in retail or restaurants for freelance gigs or contracted employment. For Cui, these side hustles amount to the same workload as a full-time job. A political science and economics double major, Cui freelances for websites such as “Pizza Bottle,” an entertainment blog; reviews products for health and wellness websites; and edits college application essays. Her breadth of work ranges from writing “15 Dog Memes That Are Too Pure for this World” to coaching high school students. Although she hopes to become an agricultural lawyer, Cui always sets aside time to pursue fulfilling projects like writing quirky online articles and mentoring high school students for a college preparation company, which pays her about $1,000 a month. Her proudest memory as a mentor came last year after she encouraged one of her students to apply to the national YoungArts competition. “She called me earlier last semester and [said], ‘Jasmine, I’m a finalist!’ ” Cui said, adding that the student hadn’t even told her parents yet. While Cui’s multiple side jobs consume a significant portion of her time, BBA Council President Jay Krishnaswamy (16Ox, 19B) works a more flexible part-time job. If a Ford Focus playing Spotify’s “Today’s Top Hits” rolls up confirming your name, Krishnaswamy could be your Uber driver. Although most Emory students recognize Krishnaswamy as a campus leader, few know that he also boasts an impressive 4.98 Uber rating. With 135 trips under his belt in the past eight months, he has learned a thing or two about ride sharing. Depending on the hours, Krishnaswamy can make $50 to $1,000 per month. His side hustle has even helped him expand his Atlanta bucket list. More than anything, driving for Uber has forced Krishnaswamy to keep his car clean, and he never drives a trip without gloves, Febreze and a roll of paper towels in his trunk for the occasional queasy passenger. To be fair, his trips don’t always go according to plan. Similar to Krishnaswamy, Thomas Odlum (21C) has tapped into the micro-mobility revolution to make some extra cash. Odlum is what Lime scooter enthusiasts call a “juicer” as well as a Bird scooter “charger.” Juicers and chargers pick up the electric scooters at night, charge them in their homes and drop them off at specified locations in the morning. Odlum, who started charging scooters in Washington, D.C., calls his side hustle “a competitive game,” as other chargers rush against each other to pick up the scooters. Odlum is not the only one who has taken advantage of this electric scooter movement. 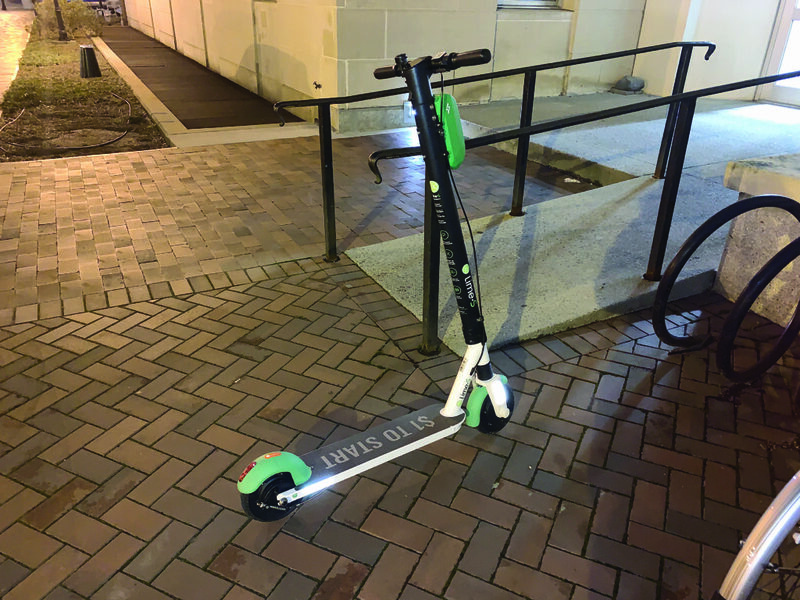 During the government shutdown, Odlum noticed that the number of chargers and juicers in the D.C. area had increased, as many government employees had resorted to charging scooters to make some money. Although Odlum has been unable to charge scooters on a regular basis at Emory, he recommends this side hustle to students who have cars. Generally, the base pay to charge a scooter is $5, according to Odlum, though it varies based on how far away the scooter is. During school breaks, he makes an average of $50 per night, but at Emory, he earns about $5 to $10 per night charging scooters at Woodruff Residential Center. Emory students have long juggled school work with traditional hourly jobs, but with the gig-economy’s arrival in Druid Hills offering a flexible, low-stakes way to make some quick cash, side hustles are becoming increasingly attractive. Seniors with extra time on their hands need only check the app store for their next lucrative job prospect.